LOS ANGELES, Nov. 15 (UPI) -- European hunter-gatherers domesticated wolves more than 18,000 years ago, with evolution turning them into today's dogs as household pets, U.S. scientists say. 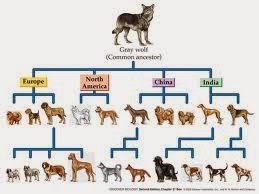 DNA studies by researchers at UCLA showed domestic dogs were genetically grouped with ancient wolves or dogs from Europe, not with wolves found anywhere else in the world or even with modern European wolves, the university reported Friday. "We found that instead of recent wolves being closest to domestic dogs, ancient European wolves were directly related to them," evolutionary biologist Robert Wayne said. "This brings the genetic record into agreement with the archaeological record. Europe is where the oldest dogs are found." The researchers studied 10 ancient "wolf-like" animals and eight "dog-like" animals, mostly from Europe. All more than 1,000 years old, most were thousands of years old, and two were more than 30,000 years old. Dogs, they concluded, evolved from ancient wolves that inhabited Europe and are now extinct. The domestication of predatory wolves likely occurred among ancient hunter-gatherer groups rather than as part of humans' development of sedentary, agricultural-based communities, the researchers said. "The wolf is the first domesticated species and the only large carnivore humans ever domesticated," Wayne said. "Other wild species were domesticated in association with the development of agriculture and then needed to exist in close proximity to humans. This would be a difficult position for a large, aggressive predator. "But if domestication occurred in association with hunter-gatherers, one can imagine wolves first taking advantage of the carcasses that humans left behind -- a natural role for any large carnivore -- and then over time moving more closely into the human niche through a co-evolutionary process."